Image via video surveillance from NYPD. 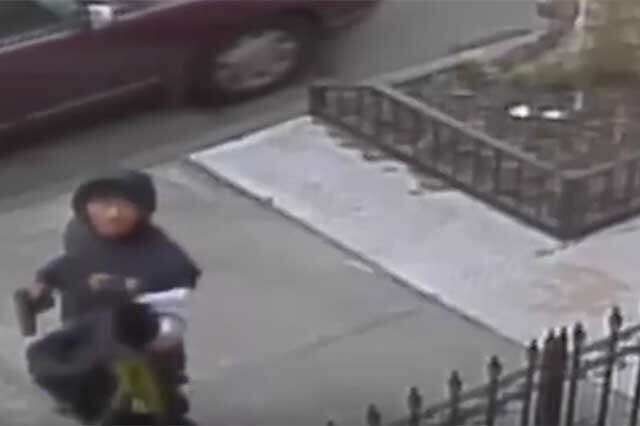 The NYPD is on the lookout for an individual who was caught on security camera pulling a gun on a cyclist while the latter locked up a bike in Bushwick this past Saturday morning. Police say that the incident occurred at about 9:30am, when the individual approached the victim, a 24 year old male, asking the time. The individual then pulled a handgun from his backpack and demanded the victim's possessions, at which point the victim ran and his assailant fired a single shot in his direction. No injuries are reported. Police describe the individual as "a 20-year-old male, Black, medium complexion, 6'0"tall, approximately, 200lbs [with] black hair," and he was last seen wearing black baseball cap, black sneakers, and a black bookbag. Anyone with information in regards to this incident is asked to call the NYPD's Crime Stoppers Hotline at 800-577-TIPS or for Spanish 1-888-57-PISTA (74782). The public can also submit their tips by logging onto the Crime Stoppers Website at WWW.NYPDCRIMESTOPPERS.COM or texting their tips to 274637(CRIMES) then enter TIP577.